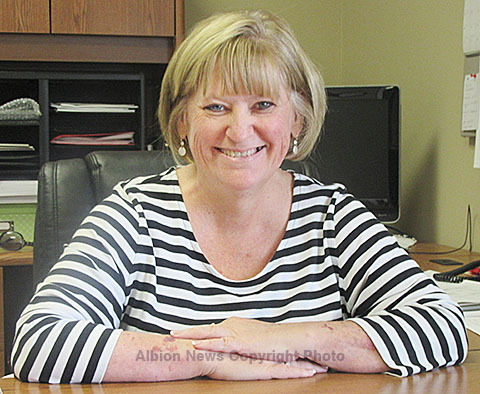 Kerry Davidson, administrator of Good Samaritan Society facilities in Albion since 2008, will be leaving her post here July 3 to take a position as executive director of larger Good Samaritan facilities in Hastings and Superior. “I will miss the staff, residents and community members here in Albion, but I’m also looking forward to the new challenge,” said Davidson. She began her duties here as director of nursing on Oct. 1, 1998, and became the administrator in 2008 to replace former administrator Haley Hunhoff when she transferred to Sioux Falls, SD. As director of nursing here at GSS Wolf Home, she developed the “neighborhood concept,” which is still in use at the nursing home. It is a common sense approach to providing consistent care for residents, she said. As GSS Albion administrator, she has overseen major facility improvements, replacing two original wings of Wolf Home that date back to 1963. The new south wing was completed in 2012, and the new north wing is now under construction. Construction cost of each wing was about $3.5 million. Capital campaigns were conducted to help finance both. Details in the June 29 Albion News Print and E-Editions.